Visiting the City Health 2012 conference yesterday I came across a piece of research (above) that brought me up short. 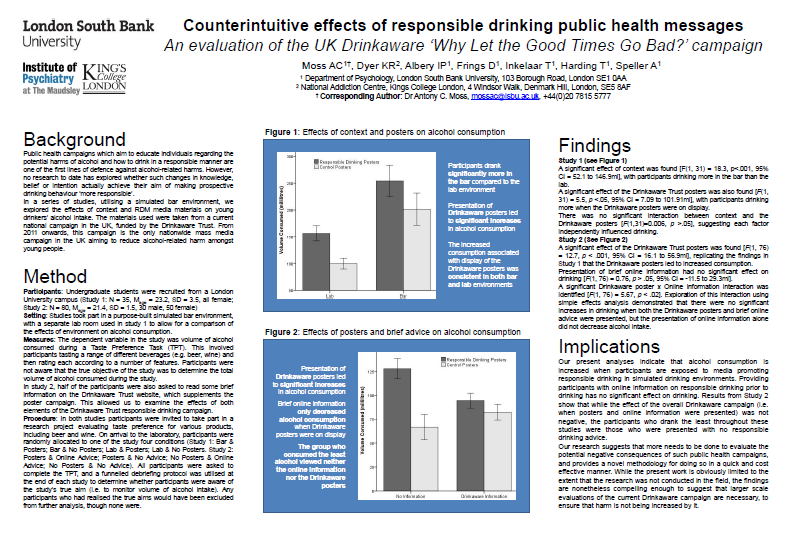 Researchers from London South Bank University and the Institute of Psychiatry at Kings College have been looking at the effects of Drinkaware‘s Why let the Good Times go Bad posters on drinking behaviour. As you’ll see, from the example on the right, the posters contrast the difference between having a good time in a ‘responsible’ manner and having a night you’d rather forget. This involved participants tasting a range of different beverages (e.g. beer, wine) and then rating each according to a number of features. Participants were not aware that the true objective of the study was to determine the total volume of alcohol consumed during the study. What they report is that those who saw the posters were more likely to drink significantly more than those who hadn’t. Understanding why the posters have the opposite effect than intended is a matter for some speculation – was it that a ‘responsible’ drinking message gives permission to drink, was it that the posters were poorly designed, was it that the messages were wrong? What we do know is that this isn’t the first time that a public health message has had a boomerang effect – the exact opposite to the one that is intended. And, while there is no doubt that this research has some limitations, the fact is they’ve replicated the results more than once and so emphasised to me that good intentions and a clever idea are not enough when it comes to a complex health intervention. The other lesson to take is that testing your product, before going to scale, should be an essential part of any prevention initiative. This entry was posted in Research papers and tagged advertising, Drinkaware by Andrew. Bookmark the permalink.